Woodeson presents Willy in a nervy twitchy style, often just gently simmering with annoyance and despair making the outbursts of rage so much more effective when they come. 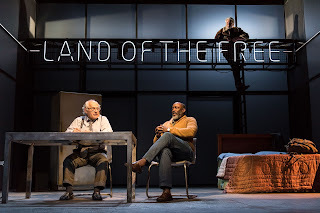 It is an impressive stage performance placing layer upon layer the increasing realisation and despair that leads him on from dismissal to grasping at the notes that his long term friend and neighbour Charley (Geff Francis) throws at his feet, however, attempting to keep some dignity by refusals of job offers. Tricia Kelly holds the fort at home with her lively and occasionally desperate bouts of enthusiasm, Kelly though cleverly allows her world-weary persona of the character the chance to show that everything is far from well. 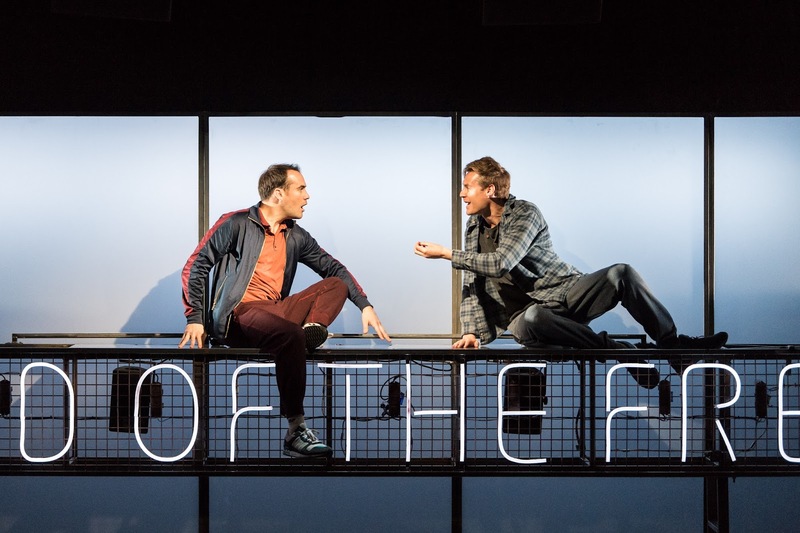 George Taylor's Biff likewise attempts to make enthusiasm overwhelm the brokenness that he is clearly feeling and via the flashbacks, it becomes very much clear that the flunking of maths is far from the true reason for his own troubles. Director Abigail Graham handles the constant flashbacks Willy is both haunted by and also joyfully experiencing extremely well. With the help of Georgia Lowe's modern style set portraying a foreboding neon sign of "Land of the Free", we weave back and forth with clarity and as Willy's world collapses, so does the sign deteriorate. The walls of the set slide back and the ghosts like those of the young Biff, Happy and Bernard (Michael Walters) playfully run in and out of the scenes. Willy's brother Ben (a superbly strong Mitchell Mullen) weaves and slides into scenes offering almost Native American style advice. 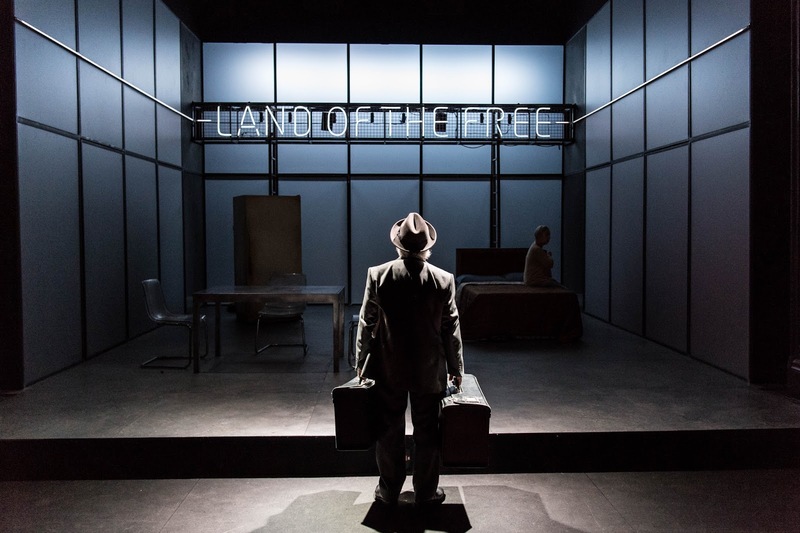 There is only one real set change and while these are often an annoying distraction in many plays, the brilliance of the movement piece created by Jennifer Jackson is so sublime as the entire set is stripped away as to make you want there to have been more. 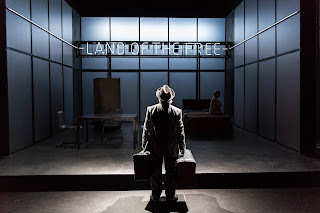 Lighting from Matt Haskins is subtle with just moments of alterations barely distinguishable as the world centres around certain key moments. 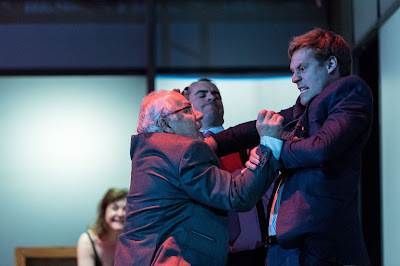 So with the exception of just a couple of moments of clumsiness over some lines and one prop, this is an excellent recreation of the classic play. 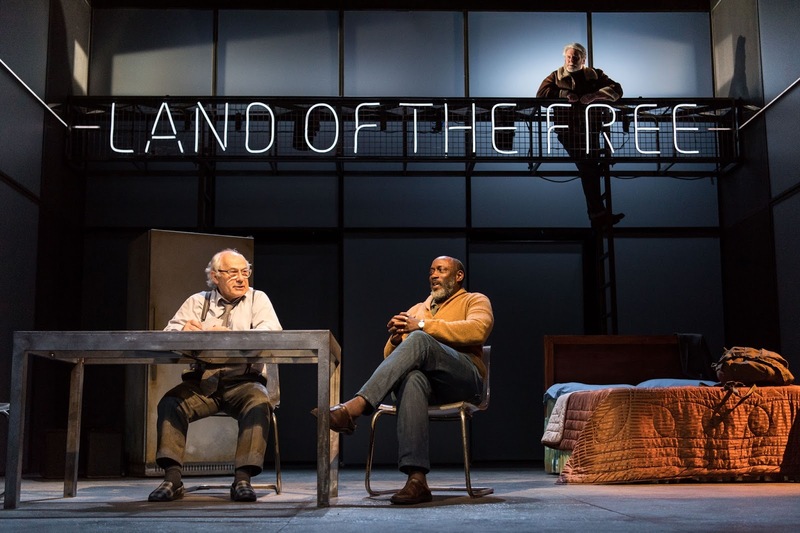 There is no doubt that both the cast and crew of this production have honoured Mr Pigott-Smith and created something that they should all be very proud of and that you should do your very best to see as it continues its tour. Performance reviewed: Wednesday 14th June 2017 (matinee) at the Royal & Derngate (Royal), Northampton.